Patrice holds a Masters by Research at QUT, which is focused on health promotion and Aboriginal and Torres Strait Islander children and families. She also holds a Masters in Health Science, a Graduate Diploma of Health Promotion and a Bachelor of Arts (Political Science & Social Science). Patrice sees her education and scholarship as a political tool for the Aboriginal and Torres Strait Islander community. 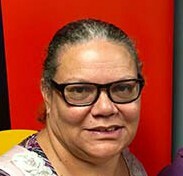 A Gangulu woman, who grew up in the Rockhampton region, Patrice has worked in a range of other geographic localities and positions, including for Queensland Health, the Australian Bureau of Statistics, the Brisbane Aboriginal and Islander Health Service and numerous other positions. She also has a long history of working in a volunteer capacity with Aboriginal and Torres Strait Islander community-based organisations.